Chief Master Sergeant Richard Loy Etchberger (5 March 1933 - 11 March 1968) was a non-commissioned officer in the U.S. Air Force who was posthumously awarded the U.S. military's highest award, the Medal of Honor, for his actions during the Battle of Lima Site 85 in the Vietnam War. Richard Loy Etchberger was born on 5 March 1933 at Hamburg, PA. Etchberger graduated from Hamburg High School in 1951 and joined the U.S. Air Force on 31 August. 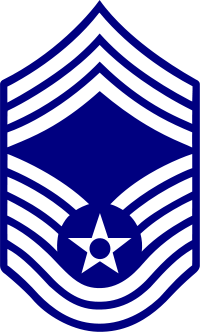 He was promoted to Chief Master Sergeant on 1 April 1967. 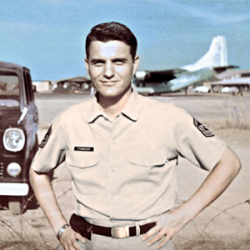 During the Vietnam War, Etchberger was among a group of airmen hand-picked for a classified mission: manning secret radar facilities in Laos. According to the 1962 International Agreement on the Neutrality of Laos, the U.S. was to have no military facilities in that country. As such, the selectees would officially become civilians employed by Lockheed Aircraft. Etchberger was deployed to Lima Site 85, used to direct bombing missions against targets in Laos and North Vietnam. The site was staffed by sixteen "former" airmen, including Etchberger, two CIA agents, and one forward air controller. Local guerrilla fighters were hired to protect the base. Between November 1967 and March 1968, Lima Site 85 directed 27 percent of all air strike missions in Laos and North Vietnam. When successful strikes were launched even through heavy cloud cover, the North Vietnamese realized that a radar facility must be nearby. Beginning in January 1968, North Vietnamese troops began closing in on Site 85. On 13 January, the base was strafed by two An-2 Colts, killing several of the local guerrillas. However, an Air Combat first resulted when an Air America UH-1H Huey Helicopter - Pilot Ted Moore / F/M Glen Woods - responded to the attack and gained them - and Air America - the distinction of having shot down an enemy fixed-wing aircraft from a helicopter - a singular aerial victory in the entire history of the Vietnam War. Plans were made to abandon and destroy the base, but they were not implemented in time. In the early morning hours of 11 March 1968, the site came under attack from North Vietnamese soldiers who had scaled the surrounding cliffs. By 3 a.m., Etchberger and six others were the only surviving Americans out of the original 19. Etchberger tended to the wounded and fought off the advancing North Vietnamese troops until a rescue helicopter arrived. He then helped load the wounded onto slings to be lifted into the hovering aircraft before coming aboard himself. As the helicopter headed towards an air base in Thailand, an enemy soldier below unloaded his AK-47 into the underside of the aircraft, fatally wounding Etchberger. John Daniel had been shot twice in the legs and was taking shelter amidst the bodies of his fallen comrades when Etchberger recovered him and fitted him into the helicopter sling. Upon regaining consciousness and learning that Etchberger himself had been killed, Daniel voiced his disbelief: "Hell, he hasn't been injured, he hasn't been shot. How is he dead?" Decades later, when Etchberger was awarded the Medal of Honor, Daniel, in an interview with Stars and Stripes, suggested: "It should have happened 42 years-plus ago, and he should have gotten a damn 55-gallon drum full of them if he wanted them." Etchberger was recommended for the Medal of Honor shortly after his death, but the nomination was rejected. Numerous accounts blame President Lyndon B. Johnson, but the decision was made by Gen. John D. Ryan, the Air Force Vice Chief of Staff, who was the USAF approving authority for top awards. The Lima Site mission was still classified at the time, and the U.S. was not supposed to have soldiers in Laos. Etchberger was instead awarded the second highest decoration, the Air Force Cross, which was presented to his family during a secret ceremony at the Pentagon. It was only after the Lima Site mission had been declassified fourteen years after Etchberger's death that his sons learned their father's true fate; they had previously been told that he died in a helicopter accident. In the early 2000s, veterans of the Air Force's 1st Combat Evaluation Group began requesting that Etchberger's Air Force Cross be upgraded to the Medal of Honor. The upgrade was approved by Secretary of the Air Force Michael B. Donley in 2008, and then by the U.S. Congress in 2009. Citation: The President of the United States of America, authorized by act of Congress, 3 March 1863, has awarded, in the name of the Congress, the Medal of Honor to Chief Master Sgt. Richard L. Etchberger, United States Air Force, for conspicuous gallantry and intrepidity at the risk of life, above and beyond the call of duty. Chief Master Sgt. Richard L. Etchberger distinguished himself by extraordinary heroism on 11 March 1968, in the country of Laos. While assigned as Ground Radar Superintendent, Detachment 1, 1043rd Radar Evacuation Squadron. On that day, Chief Etchberger and his team of technicians were manning a top-secret defensive position at Lima Site 85 when the base was overrun by an enemy ground force. Receiving sustained and withering heavy artillery attacks directly upon his unit's position, Chief Etchberger's entire crew lay dead or severely wounded. Despite having received little or no combat training, Chief Etchberger single-handedly held off the enemy with an M-16, while simultaneously directing air strikes into the area and calling for air rescue. Because of his fierce defense and heroic and selfless actions, he was able to deny the enemy access to his position and save the lives of his remaining crew. With the arrival of the rescue aircraft, Chief Etchberger without hesitation repeatedly and deliberately risked his own life, exposing himself to heavy enemy fire, in order to place three surviving wounded comrades into rescue slings hanging from the hovering helicopter waiting to airlift them to safety. With his remaining crew safely aboard, Chief Etchberger finally climbed into the evacuation sling himself, only to be fatally wounded by enemy ground fire as he was being raised into the aircraft. Chief Etchberger's bravery and determination in the face of persistent enemy fire and overwhelming odds are in keeping with the highest standards of performance and traditions of military service. Chief Etchberger's gallantry, self-sacrifice, and profound concern for his fellow men, at risk of his life, above and beyond the call of duty, reflect the highest credit on himself and the United States Air Force. Etchberger's Medal of Honor was formally presented to his three sons by President Barack Obama during a ceremony at the White House on 21 September 2010. Richard Loy Etchberger's name is inscribed on Panel 44E - Line 15. Chief Master Sergeant Richard Loy Etchberger was killed in action on 11 March 1968. Etchberger is buried at Saint John's Cemetery in Hamburg, Pennsylvania.